Traditional Baltimore Album quilts are very beautiful, but demand a lot of time, skill and patience since each block has to be unique. Machine embroidery makes the process much easier. 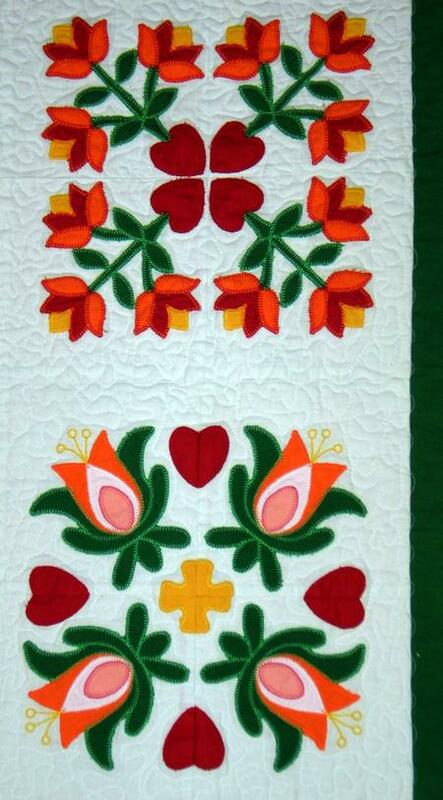 Our very simple quilt features the Applique Flower Blocks. It's finished size is about 32" x 38". 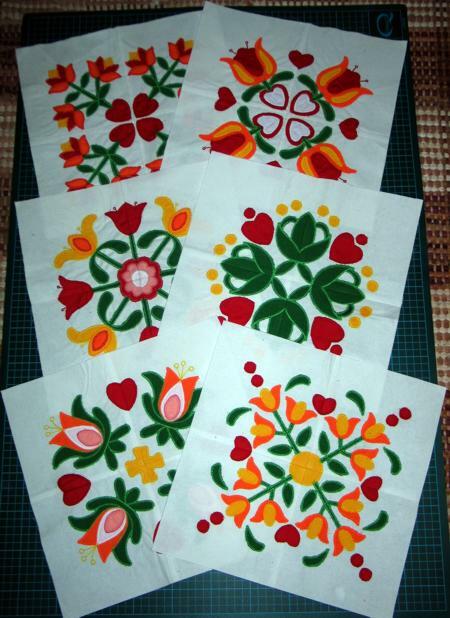 You will need to prepare the blocks as described in the Applique Flower Blocks Instructions. Trim each block to the size you need. 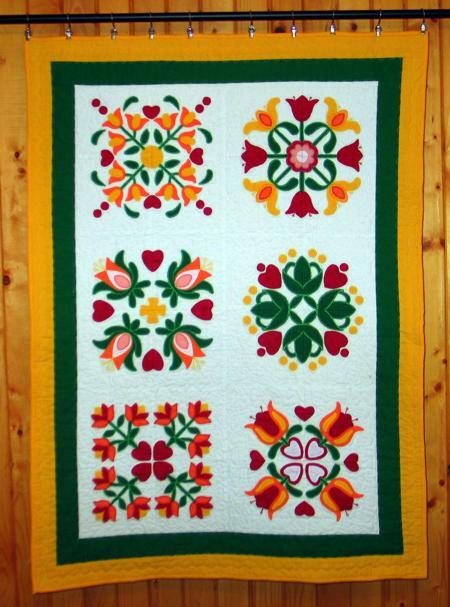 We used the designs for a large (5" x 7") hoop and trimmed the blocks to 11 1/2" x 11 1/2" size. After sewing with a seam allowance of 1/4", the finished size of the blocks became 11" x 11". For the green border, we cut 2 strips measuring 2 1/2" x 33 1/2" and 2 strips measuring 2 1/2" x 27 1/2". For the yellow border, we cut 2 strips measuring 2 1/2 x 38 1/2" and 2 strips measuring 2 1/2" x 32 1/2". Sew the blocks into 3 pairs. Each pair is a row. Sew the green 2 1/2" x 33 1/2" strips to the left and the right sides. Sew the green 2 1/2" x 27 1/2" strips to the upper and lower sides. Sew the yellow 2 1/2" x 38 1/2" strips to the left and right sides. Sew the yellow 2 1/2" x 32 1/2" strips to the upper and lower sides. Pin all three layers together with 1" pins and start quilting. We quilted around the applique and made stippling all over the quilt.